The day of the English archer with his longbow and cloth yard shafts, the Genoese with their crossbows, and the Mongols and Huns with their horn-and-sinew recurved bows, is long passed. The time when arrows could darken the sky with their vast numbers is no more. The moment when a knight in his armor would fear the hiss of the gray goose fletched shafts as they flew toward him has vanished into our past. But, in the 21st century they are not forgotten. Warriors using swords and wearing armor still fall to the strike of a well-aimed shaft. Currently in North America, Europe and Australia wars take place where the opposing sides wear armor and carry swords, shields; axes, spears, pikes; bows and, crossbows and meet in battle under billowing banners. In these wars, there are archers in the ranks of the fighters. When the battle begins and the two sides charge toward each other, the archers loose their arrows at the massed formations of the opposing forces. When the lines collide with the sound of weapons striking shields and armor, the archers pick out individual targets, aiming their shafts between the upright pikes and spears or around a shield or helm. Arrows smash into helms and armor, shields or weapons deflect a few, but many hit their targets and they fall wounded or killed. Some of the enemy close with the archers; their swords and axes slash, and some of the archers go down to join the bodies of the slain. A keen-eyed archer spots the enemy leader behind the opposing ranks; he nocks an arrow to his string, draws, aims and looses in one fluid movement. The arrow arcs over the helms of the opposing forces and descends into the mailed chest of their leader. He drops to the ground. Now, without his guidance, his troops are flanked and are slowly cut down by sword, spear and arrow. Finally, all is over. Only the victors remain, standing over the fallen. There is a roar of triumph as they raise their weapons overhead. Then, the fallen begin to rise to their feet. The victors give them a hand up. Both forces talk and joke with each other as they leave the field. The archers retrieve their arrows from the ground before they leave. Weapons, shields and helms are dropped to the ground, and the hot and sweaty men and women are given water or Gatorade to drink. 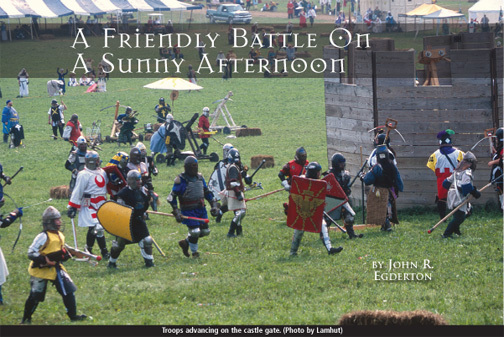 Many get out of the afternoon sun, and sit down in the shade to rest before the next battle of the day starts in half an hour. This is not the 1400s in France or Germany, but America in 2003. 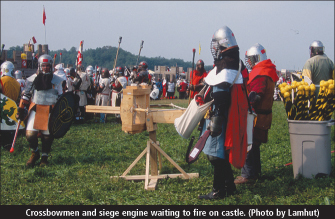 The troops are neither French, English, German nor Italian; they are members of the Society for Creative Anachronism, an organization dedicated to researching and recreating the Middle Ages with branches in all the 50 states, Canada, Europe and Australia. It has, for the last 38 years, recreated and researched some of the many aspects of the Middle Ages: costume, cooking, dance, music, heraldry, crafts, etc. A main focus of the group is tournament combat with sword and shield, but having wars is also a favorite activity. The wars can range in size from small local wars, to very large wars that have people attending from all over the United States and overseas. The largest war takes place over two weeks in August, in Pennsylvania, and has about 10,000 costumed members attending and around 2,000 fighting in the battles. The fighters are armored in everything from a minimum amount of padding, a helmet, and elbow, knee, hand, groin and kidney protection, to the other end of the scale, those in full plate armor from head to foot. For safety reasons steel weapons are not used. The swords and other hand weapons are made from rattan, which does not break and has some give on impact. However, sometimes the impact will dent even well made 16gauge helmets and chew holes in the edges of half inch plywood shields; when a weapon hits unprotected flesh, it may leave vivid bruises. The fighting is not choreographed; all the fighters on each side are fighting as hard as they can to win. The archery used in combat in the wars is, for safety reasons, limited to lighter draw bows than were used in period; broad heads and bodkin points are not allowed. To prevent injury to the eyes, the arrow heads have a minimum diameter of 1-1/4 inches so that they cannot penetrate the visors lot or bar grill of a helm. The blunt heads have a striking surface of either soft plastic or heavy foam. To prevent injury from splintered wood shafts, most shafts are now made of solid1/4-inch fiberglass rod. To prevent possible injury if an arrow shaft were to bounce back, nock-first, into an eye or be fallen upon, there is a short length of 1-1/4-inch-diameter shatter proof tubing in place of the fletching, which prevents the nock from entering a grill or visor more than a half inch. This tube also stabilizes the arrow as well as fletching would. Even with these seemingly low draw–weights, bruises to areas of the body with bare skin or only protected by light padding are common. 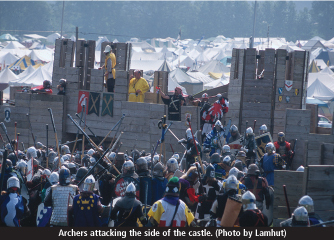 The types of battles range from open field battles—where both forces line up in formation on opposite sides of the field and then move together to attack—to castle battles. Some of the sites have wooden castles with towers as well as walls and gates, while others are constructed of stacked hay bales. The fighters use a simple system of counting hits. A good hit by a hand weapon or missile to the head or torso counts as a kill, while a good hit to a limb causes the loss of that arm or leg. This is done on an honor system; the person hit decides if the blow was good or not. At one of the larger annual wars where archery and siege engines are used in most of the battles, a total of well over 10,000 thousand arrows may be loosed in the several days of battle If an archer is lucky and not killed early in a battle, he can use up many arrows. 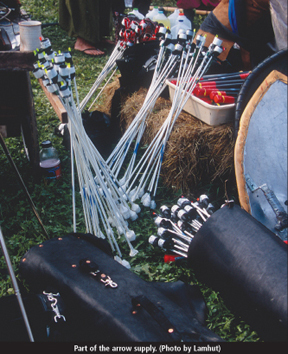 Some archers will carry50 or more arrows and will have additional supplies stored on the field to replenish their quivers as needed. Combat archery is totally unlike target or field archery. It is even unlike hunting, unless you are in the habit of shooting at fast moving two hundred pound gorillas in armor with shields to block your arrows, and swords to pound you to the ground if you miss. Seldom do you have the chance to pick good footing and a normal stance. You frequently have to shoot while in a milling, jostling throng of your own fighters. You try to get a clean shot between the moving helms and raised weapons in front of you, and to hit your targets without them dodging or blocking your arrow. At the same time, that you are trying to focus on a clean shot at an enemy fighter 20 yards away, you also have to remain aware of any arrows or enemy fighters coming your way. However, making a really good shot is a memorable experience: You loosed, just as the command to start the battle is given, to nail the enemy commander at50 yards just as he starts to give the command to charge your lines. You were chased by a fighter with sword and shield and while on the run you nocked your arrow, then turned, dropped to your knees and shot, killing the fighter a few yards away. In a battle where only face shots counted, you nocked your last arrow and hit the 1-inchwide visor slot of a fully plated fighter charging you from 20 yards away. You lost an arm and then used your bow as a foot bow with your good arm to shoot and stop an enemy fighter closing on you at 10 yards. You took out the engineer of a siege engine that was destroying your castle walls, even though he was protected by the shields of a unit of fighters. The good feeling you get from any difficult shot that is well made and strikes your target. Fighting as an archer in these battles is great fun, and good exercise, and it brings you a little closer to understanding what it may have been like to have been an archer in battle in the Middle Ages. Moreover you get to shoot your friends and still feast with them at the end of the day. One word of caution: The special arrows used in combat have been designed and tested to reduce the chance of injury. You can not just add some padding to a shaft and have a safe arrow. 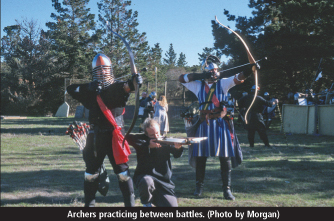 You should not attempt combat archery without the proper protective safety gear, and safe bows and arrows. More articles are available from Primitive Archer magazine. To order the issue this article appeared in (Vol 12, Iss 2), or to order a subscription, visit Ordering.